Operate without Restrictions – Sam is back in his tactical suit and goggles, and he’s more deadly than ever. He is the only secret operative with the power to act above the law, and uses ruthless methods to interrogate enemies in order to extract crucial information that will prevent the next Blacklist attack. Pursuing the terrorists to the far reaches of the world, Sam flies from exotic locales to U.S. cities as he races against the clock to find out who’s behind the Blacklist. Thrilling gameplay is enhanced by full motion performance capture, creating a highly cinematic experience. Unleash the power of 4th Echelon Prototypes – Blacklist innovates from the roots of the franchise, and players can enjoy a series of twists on franchise favorites including reinvented classic weapons. Infiltrate terrorist cells by using new gadgets such as the upgraded snake cam and micro-trirotor drone which allows Sam to scout ahead, mark targets remotely, distract enemies, or explode with frag grenade force. 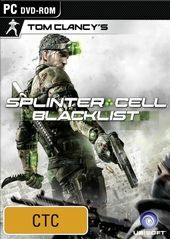 Blacklist is also bringing back fan-favorites like the sticky shocker, and for close quarters combat, players can wield the curved and brutal Karambit knife. Enjoy a Fully Integrated Experience – Sam and his team are aware of terrorist attacks in real time thanks to the Strategic Mission Interface (SMI). The SMI allows the team to receive data about mission objectives while on the move. Players can earn money for completing missions and objectives and buy upgraded weapons and items from the SMI hub aboard the Paladin. I will become what you fear most. Needed an actor with Fisher's physicality. A new way to play the E3 reveal map. Inexplicably filmed in a storage lock-up.